Following on from their win in the first round of the FIM world championship cup Mansfield sidecar racers Ben and Tom Birchall travelled the relatively short distance to Oulton Park in Cheshire where they took a decisive victory in the opening round of the British Sidecar cup. Throughout free practice and qualifying the Mitchell’s of Mansfield supported brothers dominated proceedings and qualified as fastest F2 by over four seconds and were fifth overall to start the 12 lap race from the third row of the mixed grid of riders. The weather was abysmal throughout the weekend but the skies cleared in time for the race late on Monday afternoon. 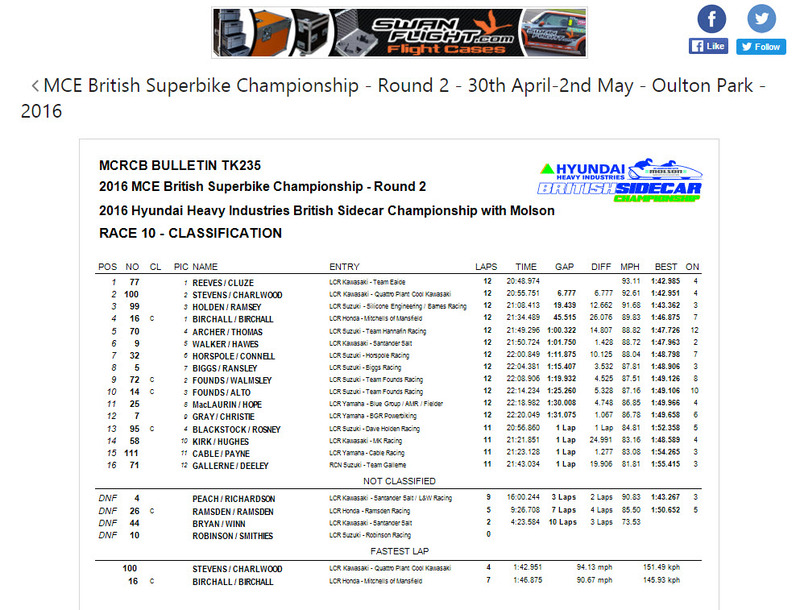 As the lights went out Ben and Tom slotted into sixth place overall and were leading the F2 class by a good margin. One lap later they were up to fifth and on lap nine they moved into fourth overall. They held their position throughout the remainder of the race to cross the finish line for a decisive win of over 30 seconds from Founds/Walmsley who were the second Cup riders over the finish line. 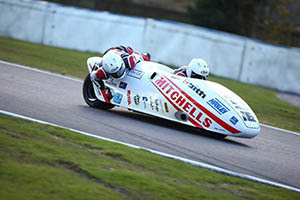 Amazingly the Birchall brothers finished in fourth place overall beating many of the more powerful F1 machines who were using a 1000cc engine compared to the 600cc of the Birchalls. It was a busy weekend for the team because as their race at Oulton was late in the day, they took the opportunity of nipping over to Darley Moor which is only an hour away to do some testing with their TT outfit in preparation for the TT festival which takes place at the beginning of June. The next race for Birchall Racing will be the second round of the British cup championship at Brands Hatch on May 22 and the team then move over to the Isle of Man where last year they recorded a winning double.